The Great Art for Art Supplies Experiment! I create a LOT. A WHOLE lot. And I layer. A LOT. You send an Amazon gift card to mellietest (at) gmail.com and I send you magical art! See my usual listing here. 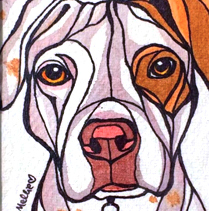 I'll create a commissioned HeartFULL Pet Portrait - in my signature style - just for you. I'll even do a short timelpase video for you as a very special extra treat! You get to choose any of the currently listed unicorn pieces from my Unicorn shop. The #inktober series were so much fun to make (and can also be found on RedBubble here)! You can also choose an original piece from my animal oracle decks - either the Messages of Meow or Messages from the Dogs Oracle decks! Each animal has its own message!